Providing exceptional commercial fitouts, refurbishments and construction for commercial and government clients across New South Wales and Queensland. We focus mainly on medium sized projects, delivering accountability, agility and collaboration through everything we do, from the smallest interaction to the largest project. Not only do we provide exceptional quality commercial fitouts and refurbishments, we also ensure stress-free and seamless construction projects for every client. We have a reputation for building strong relationships on foundations of respect and keeping our cool in the face of challenges. Our clients trust us, knowing that we are flexible and resourceful, and always ready to take complete ownership by doing what we say we are going to do. Whether you choose us as your design, construction or project manager, we are committed to delivering excellence at every level. Working alongside his grandfather, a builder and handyman, Andrew gained hands-on experience in the construction industry from an early age. Andrew graduated with honours from a Bachelor degree in Building Construction Management at UNSW. After working for a decade for leading Tier 2 construction management firms, Andrew co-founded Evolve Constructions, believing anything is possible. Over the past 20+ years, the last 12 of which have been with Evolve, Andrew has been involved in the successful delivery of more than $250 million of government and commercial projects across the east coast of Australia. His commitment to excellence and skills have won him multiple MBA Excellence in Construction awards. At Evolve Andrew spearheads our business development and pre-construction activities. Evolve’s loyal team, the company’s astounding growth and various industry awards all attest to the merit of Andrew’s main philosophy: it’s all about relationships and collaboration. When he takes off his company director’s hat, he spends time with his family, ultra trail running, surfing or coaching the local kid’s soccer team. Mark is driven by the pursuit of excellence. With 20+ years’ industry experience, 12 of which as Co-Founder and Director at Evolve, Mark is passionate about the Evolve team and leads the company’s operations and construction activities. He takes great pride in the quality of work they deliver. Prior to establishing Evolve Constructions, Mark studied a Bachelor of Building Construction Management at UNSW. Throughout his studies Mark worked at a variety of property development and construction companies. Following university Mark commenced working for a Tier 2 construction company on a variety of projects across New South Wales and Queensland. Over the past 20+ years, Mark has facilitated the completion of over $350 million worth of projects. These include projects where Evolve has won MBA Excellence in Construction awards. His work ethic, attention to detail, and ability to successfully deliver challenging projects have all been instrumental in shaping the Evolve Constructions brand as it is today. Apart from his company, Mark is passionate about spending time with his family and studying to obtain his pilot’s license. After a long-standing association dating back to university, Michael has partnered with Group Directors, Andrew and Mark, to develop Evolve’s brand in Queensland. He brings a solid reputation for honesty and integrity that has been built over 20 years. Michael has worked his way through numerous roles from the ground up, having studied a Bachelor of Building Construction Management at UNSW. He spent 4 years internationally throughout the UK & Canada followed by 11 years with a Tier 2 construction company in Australia. His experience at delivering projects of up to $30 million in value is based on building strong relationships founded on trust and reliable service. Michael spent 7 years spearheading the establishment and unprecedented growth as Queensland State Construction Manager of a market leading retail builder, enhancing their reputation within the industry. Among his recent successes, Michael has paired business development acumen with the effective delivery of a large number of time-critical, complex projects that has seen a rapidly growing client base for the Brisbane office. When unwinding Michael enjoys time at the beach, camping and fishing with his young family. Matt’s business philosophy ‘accept the challenge, build relationships, and exceed expectations’ is reflected in everything he does. Matt’s industry experience spans over 28+ years. His passion for building and construction drove him to complete his first trade qualification at a young age. From there he progressed quickly within a reputable Tier 2 construction management company, becoming a site manager on Sydney CBD $5-50 million fitouts. He went on to successfully manage various projects in the UK including the rollout of Sainsburys’ stores across the UK. He joined Evolve on his return to Australia in 2013, bringing his wealth of commercial experience. In his time as Senior Project Manager, Matt steadily developed the new role of NSW Construction Manager. Matt is a born problem solver, which he uses to adapt to curveballs both within Evolve and externally with clients, while placing great emphasis on compliance and safety. His passion and hands-on leadership style is perfect for leading our fast growing project delivery team in ensuring high quality, seamless construction projects for all our clients. Snowboarding and surfing are Matt’s particular passions alongside enjoying time with his wife and kids. Streamlining procedures and processes is Melissa’s passion. Her goal is to help fulfill our clients’ dreams by smoothing our processes and supporting the business’ expansion. With experience in a number of industries including corporate and non-profit event management, she is an excellent problem solver in high paced environments. Melissa enjoys working for a growing business as it gives opportunity to influence business strategy, operations and company culture. Her analytical mind helps us find creative solutions and her perseverance ensures that our carefully thought-through plans come to fruition. Melissa finds inspiration outside of work enjoying beach volleyball, yoga and aerial/acrobatic arts. With a diploma of Interior Design and over 32 years’ experience in the industry including major fitout projects for multi-national companies in various sectors, Steve has the perfect background for his role with Evolve. As estimating manager, Steve drives our estimating team to achieve tight deadlines with pinpoint efficiency and accurately assess the value of each project. His ability to draw on a wide range of experience in cost estimation, financial control, business and project management is a major asset. Steve works quickly and efficiently to source quality contractors at the right price as well as maintain excellent communication and relationships with all stakeholders in the pre-construction phase of a project; from clients and architects to subcontractors and suppliers. On the weekends, Steve takes the opportunity to enjoy his motorcycles and powerboating with family and friends. Evolve Constructions implements an integrated management system that has received JAS-ANZ certification to be compliant with AS/NZS 4801, ISO 9001 and ISO 14001. This system has also been audited to be compliant with NSW Government WHSMS Auditing Guidelines (5th edition). 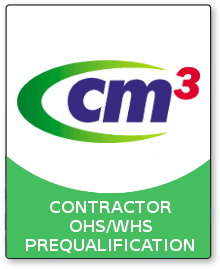 Drawing from our established integrated management system, Evolve Constructions maintains Cm3 pre-qualification. This focuses on delivering health and safety management our clients can rely on. Evolve Constructions is an accredited NSW Government Contractor having completed numerous Government fitout and refurbishment projects in Greater Sydney and Regional NSW. Evolve have been awarded multiple MBA Excellence in Construction Awards, most recently in 2018.